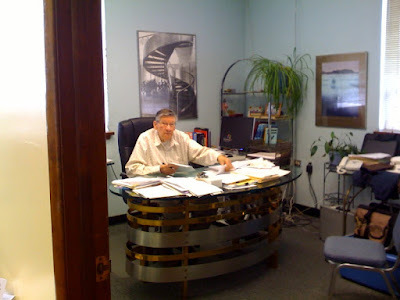 My sister took this picture of my dad at his office. See the cases in the lower right corner? Those are full of my camera, grip and electric, and costume stuff. Yup, that's the kind of dad he is -- I have a HUGE pile of stuff in his office and he puts up with it (while we're filming.) He's going to be 83 in September.